Being a total self confessed ‘foodie’, I could think about food, talk about food, eat food all the time! So when we get the chance to leave the children at home for a couple of nights and fly to London, we dropped everything – booked the flights and our table at Tom Aikens in Chelsea! Toptable had a super lunch time deal – £31 for 3 courses and a glass of house wine. For lunch time this is perfect and a very cost effective way of experiencing a Michelin starred restaurant. 14:00 found us in the Royal borough of Chelsea (our old stomping ground, before leaving over 8 years ago to move to the Northern Alps and follow a dream) walking past the registry office on the Kings Road where we tied the knot 5 years ago (very romantic!). Tom Aikens main London restaurant on Elystan Street, is very discreet, you would be forgiven for walking past it. No signs, just sleek dark exterior walls and an understated front door. Inside after a warm and sincere welcome we were shown to our table by a window and began to take in our surroundings. It was late September, Autumn settling in outside and the mood and colouring inside matched beautifully. Gorgeous bespoke dark oak furniture, smoky coloured walls, slate, organic, leather. The staff wearing mismatched tweed, denim, cords and brogues looked just the part having step out from the country estate. Our seasonal menu was delivered in a scroll tied with a ribbon. The first thing to order was of course 2 glasses of champagne! A great way to start. 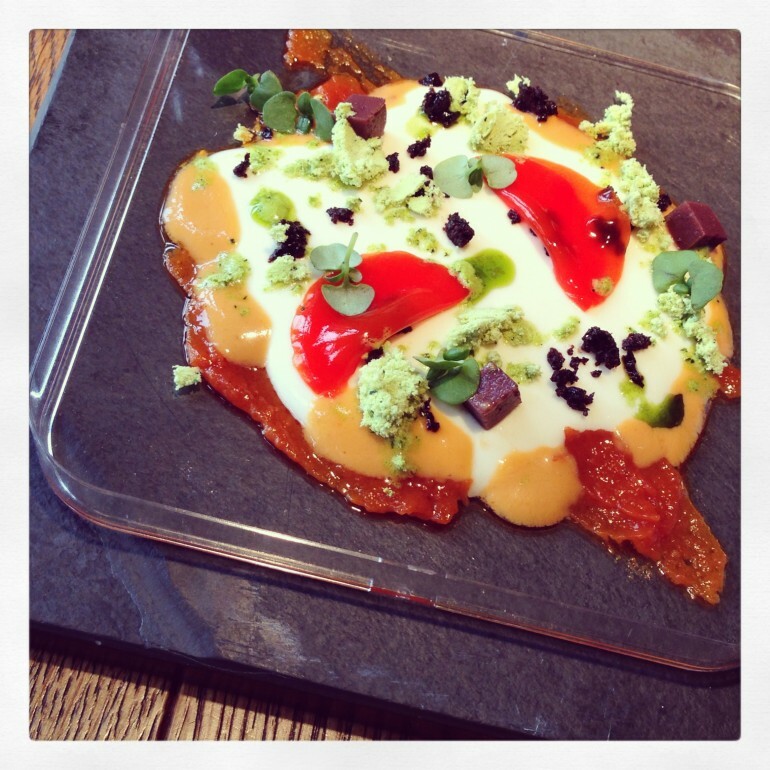 Next followed the amuse bouche – a red pepper jam, crushed olives, cress and panacotta served in a petri dish on slate. Subtle flavours yet all of them having a say…..already a unique Tom style of presentation was clear. Bread…incredible! 5 different types of freshly made bread served hot out of the oven with 3 assorted types of butter. The mushroom butter with the brioche was sensational. Entree, Hare cooked 4 ways with pea jus and autumn berry’s. I have never tasted this game meat before – it was richer in texture than rabbit, similar to venison. So flavoursome. Main, Pigeon served with barley risotto and pigeon ravioli. It was rich and utterly tantalising. Neither of us spoke a word throughout both courses! (Most unlike us!) The china each course was served on looked handmade, organic and suited the dishes wonderfully. The nicest thing was not to see any ‘white’ in the building, the only time it was spotted was the milk foam on the macchiato. Dessert was a pineapple freeze dried, powdered and caramelised, intense flavours and again beautifully presented. Coffee was served with the most amazing selection of petit fours – dark chocolate fudge on a bed of pine, mini cheese cakes and whisky jellies in a jam jar and with tweezers! Amazingly innovative and memorable, a fabulous way to conclude our anniversary treat. For us the level of service blows us away and much of the detail can be taken and applied to what we do – it could be the way that the plate is placed in front of you or the way that the staff know exactly what you want without even asking. Hotel L’aubergade might be a 2* hotel but we can aim to offer 5* star service and within the Mountain Mavericks chalets the luxury of having everything thought about for you. All in all, it was an unforgettable experience, that we would love to repeat. Sadly this restaurant is closing in Chelsea, as Tom is in search of a more central London location for his flagship. We shall be keeping tabs of the new location……But in the meantime, there are his other ‘kitchen’s ‘ at Somerset House, Chelsea and Canary Wharf, where they offer “Comfort food favourites in a relaxed and informal environment”. We love this form of dining and use the essence of this type of menu to base our chalet and hotel menu’s. We loved how the decor of Tom’s Elystan Street, restaurant really reflected the mood of the food and created such an experience and shall be working on that very much so in the bar and restaurant at the hotel. Going to lunch via a deal such as Opentable allows you into a world of Michelin star’s at very reasonable prices. Using Opentable we have also eaten at Gordon Ramsey’s Maze where the offer was £30 for 4 courses and a bellini and Roux at the Landau £36.50 for 3 courses and a glass of champagne.